Hello everyone! A friend/co-worker of mine asked me to make two baby shower cards for a His and Hers shower she is throwing at the same time. Her theme is elephants and she asked me to keep the cards within the same theme. Well it seems that elephants are “in” right now but unfortunately the elephant stamps I was looking at were being released too late! Thankfully I found a safari stamp set by Some Odd Girl and it had two different, very cute, elephants. I practiced so many times coloring these in with my Copics, and I still need more practice! But… I’m happy with how my coloring skills are coming along! I decided to keep it simple because the simplicity of homemade cards has been getting my attention a lot lately. I stamped the background with some Studio Calico stamps, and I did some tone on tone stamping with Papertrey Ink ink and paper. I also used Lawn Fawn’s Sophie’s Sentiments, which is a great stamp set to have because it comes with so many sentiments. I also made my first card set, my friend asked for a set to give away as a prize. Those cards will be posted on my next blog post so stay tuned! 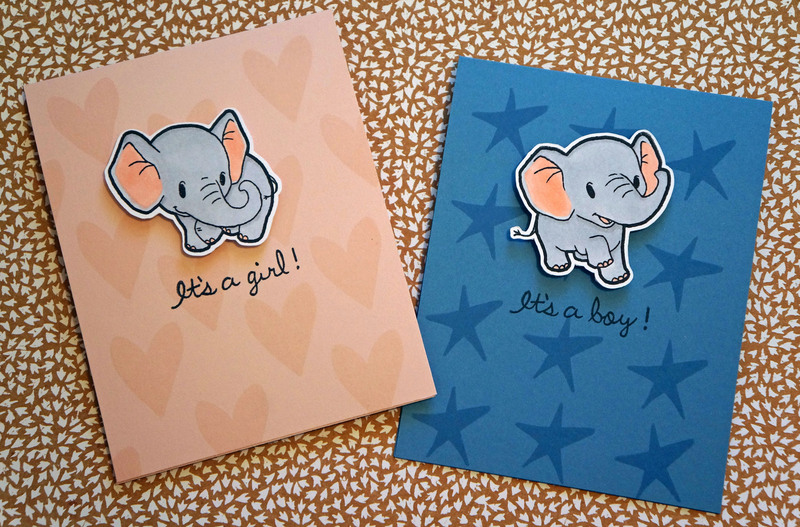 I’m so glad to hear elephants are “in” because they’re my absolute favourite critters to put on cards! Love what you’ve done here and the elephants are adorable.